Download the GEMS Rewards App from your preferred app store to avail instant savings and amazing deals. GEMS families can explore cashback opportunities on student referrals and through the GEMS FAB Titanium Credit Card, and enjoy incredible savings and discounts across various experiences. You can also earn GEMS Points through our exclusive partner network and through our online shop, The Marketplace. These GEMS Points can then be redeemed against school fees. Learn more about the different ways you can use GEMS Rewards to save and earn. Earn Points through the GEMS Rewards programme and use them to pay your child's school tuition fees. Refer a friend to a GEMS school and earn 4% in GEMS Points on successfully enrolled referrals. Use the GEMS FAB Titanium Credit Card to pay school fees and earn up to 4.25% back. 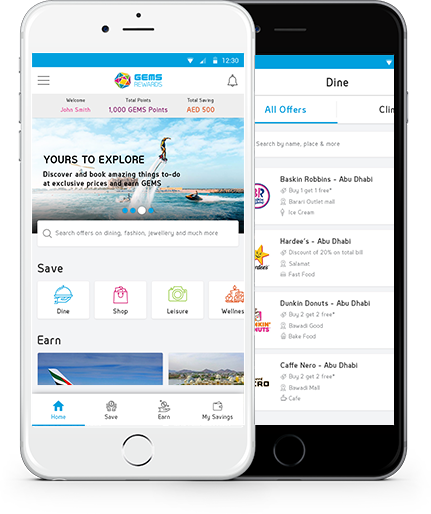 Discover incredible deals and start saving by redeeming exclusive offers across our network of partners. You can also earn GEMS Points which you can later redeem against school fees. Shop for those must-have essentials and life’s luxuries on The Marketplace, a dedicated online store exclusively set up for our GEMS families. With each purchase you will earn GEMS Points making it the most rewarding online experience around. GEMS Points are a virtual currency exclusive to GEMS Rewards. GEMS Points can be earned in a number of different ways, including through select merchants on the app and by making purchases on The Marketplace website. GEMS Points can then be used against school fees. GEMS Points earned through merchants on the App will reflect in the users account 45 days after the date of redemption. This is the same for GEMS points earned through the Ambassador Programme, ENBD bank loyalty point conversion and use of the GEMS FAB co-branded credit card. GEMS Points earned by making purchases on The Marketplace will be credited immediately. GEMS Points will be added into a wallet on the App as they are earned. Once a minimum amount of 2,225 GEMS Points have been accumulated they will become available for redemption. Just swipe left from the home screen. When a user reaches a minimum of 2,225 GEMS Points in their available wallet, they will be able to use them against school fees. The user will need to pay their school fees through the Oasis Portal or at school through the cashier service. Once GEMS Points have been redeemed they cannot be reversed or reinstated. GEMS Points will have a minimum expiry of 11 months and 30 days and a maximum expiry of 23 months and 30 days. All GEMS points earned in the current school year defined as 1st September to 31st August will expire on 31st August the following year. Choose your preferred app store and download the app to avail instant savings and amazing deals. Copyright © GEMS Education. All rights reserved.